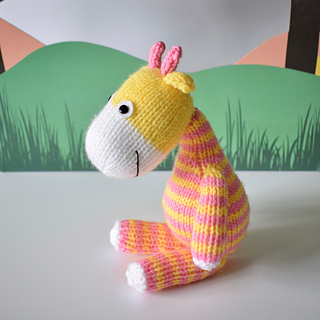 The giraffe is approximately 25cm tall (standing). 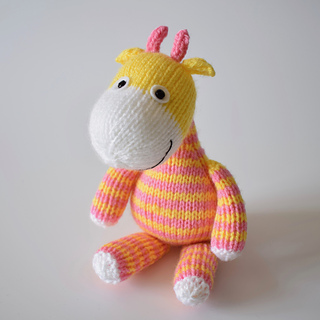 Jimmy Giraffe is knitted in bright colours to make a cheerful toy. 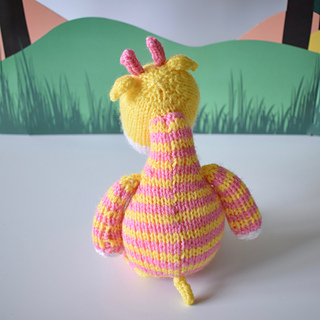 TECHNIQUES: All pieces are knitted flat (back and forth) on a pair of straight knitting needles, apart from the ossicones (horns) and tail which are i-cord worked on two DPNs. You will also need to cast on and off, knit, purl, work increases and decreases, sew seams and knit stripes.